Think about the last time someone asked you a question that totally caught you off guard. The biggest time this happened in my life was during my first year of Bible College. One, while on break a classmate came up to me and asked me if I was selling heroine. As you can image, I was in shock! His question stumped me. In my past I had sold drugs, but I’d never touched heroine. The problem is his question was less of a question and more a declaration that I’d been selling. In his tone if felt like I was already guilty and needed to be proved innocent. I tried as calmly as I could to ask him where he heard this. The question of me selling was more than frustrating but his response was infuriating. He told me that another class member had told him and she was scared to confront me. To be completely honest I shut down and was so angry. It was one of those times in my life that I couldn't think straight I was so upset. My life had completely changed with Jesus and the last thing I wanted to do was touch drugs again. I was working a job, waking up early, going to school in the morning, work in the afternoon and back to school at night. If I was selling heroine I wouldn’t be holding that schedule or working the low paying job I had been working. I wouldn't have been living in a small apartment and driving an old truck. It wasn't just a financial insult, it was the thought of my past trying to steal the future God had for me. The main insult felt like an attack on my character, and that hurt the most. I excused myself from class that morning to talk with one of the leaders of the school. See before I met Jesus I would go and handle conversations like this in person but no one was telling me the source of the rumor. My initial intention was to go to the person's home and have a conversation with them. An in all honest, my words would have been few. I'm embarrassed to admit this, but this is me being vulnerable. Finally the leader was able to figure some things out and it came to be that a guy I had never met heard a rumor about me and told this girl in our class during a Bible study. He confused me with another person and blew the whole thing out of proportion. You know how it came out? He shared during the prayer request time of Bible study. This instance in my life reminds all of us have badly misinformation can hurt a person. Think of the pain that rumors cause people. Reputations are ruined by rumors. Marriages are destroyed by miscommunication, relationships are severed with poor information and churches are destroyed by the small spark of a lie. When you think about your life, how have rumors hurt you? Maybe you’ve been the victim of a painful rumor just like me. We’ve all seen the personal impact of how rumors impactor lives, our family, a love one or the local church in some cases. On Sunday I taught on Acts 21:17-22:29 about the pain of rumors. Paul was a misunderstood man who almost lost his life due to a misunderstanding. You can read the passage in Scripture and find out that a small amount of legalism had snuck in the church, it went unchecked and then started a mini-riot at the temple. When we read about Paul's expeditions and experience we see that he lived boldly in Christ. This week I encourage you to live boldly in Christ. Be a truth teller and not a lie creator. Don't spread words that you know aren't true. Talk to a person and not about a person. Be a person of your word and work towards unity. We need more unity now! At our church we make sure rumors don’t have a leg to stand on. We’ve all seen the pain that rumors can cause in our personal lives and in the life of the church. Rumors cause drama and drama tends to cause pain in the lives of those involved. Listen to this Proverbs from God’s word: “Without wood a fire goes out; without a gossip a quarrel dies down.” (Proverbs 26:20). The way to stop rumors is to commit to being a truth teller. Most of us have probably thrown a log or two on a fire at one time, I know I have. I invite you to change that. I want to invite you to be a truth teller instead of a rumor spreader. If you’re tempted to fall into gossip and rumors, think about the repercussions on the other person and how you’d like to be treated. Remember the words of Christ, “ Do to others as you would have them do to you.” (Luke 6:31). Make a commitment to be a truth teller. Yesterday at our vision meeting we shared the core values of Coastline. Coastline has a rich history of being a light in Ventura. A few months ago our elders decided that we would gather with our staff and restate our core values. These core values are the best version of our church. We will not use lip service and say we value these values; we will truly value them. We will put the best of our efforts into these areas and do them with excellence. (Please note that this list is not in order or importance, we just had to start somewhere). Almost a year ago to the date, Charity and I hopped in our car and drove south from the San Francisco Peninsula. We arrived in Ventura on a Saturday and had lunch with the pastoral search team at a local pizza place. That night we had time to pray and process what God might be calling us to next. The next morning we attended our first service at Coastline Bible Church. We immediately felt a connection to what God was doing here. We loved the community, the worship and how friendly everyone was to us. As I look back on that first visit, it amazes me that this coming Sunday we will be sharing the next steps we feel God is calling us to as a church. 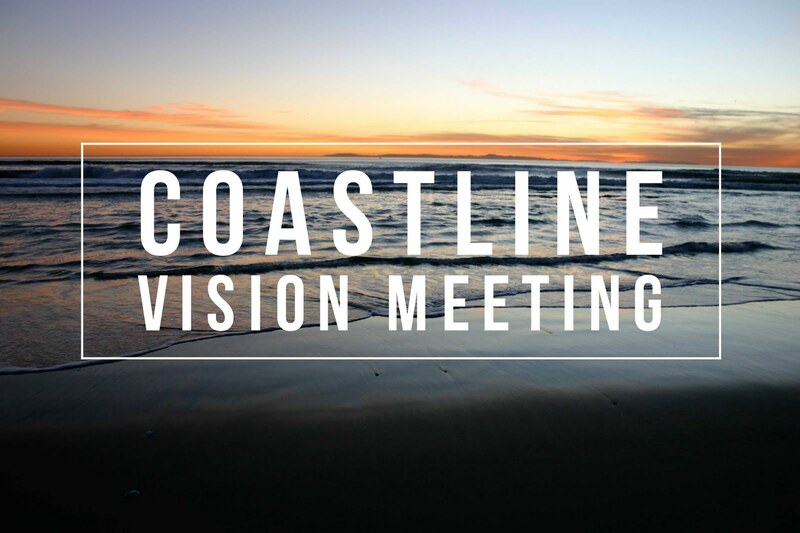 Over the last several months I've been in prayer and constant conversation with God about the vision for Coastline. (The mission explains why a church exists; the vision clarifies where the church is going in the future.) Last month I presented a God-sized goal to our elders. After much discussion, we unanimously voted to move forward with this vision. For the last several weeks our staff has been working on the strategy for this and preparing to share the vision with you. This Sunday, January 21, we are going to communicate that vision in a special meeting right after our worship service. We want to get this vision out to you as soon as possible so we can all be united on where God is calling our church. I wish that I could write it out in this email, but you will hear it soon enough. Please mark your calendar and make it a high priority to join us this Sunday at our vision meeting. During my time in ministry I've seen some great leadership transitions and some train wrecks. The first transition I saw is one I will never forget. I was serving at a church and we were looking to hire a new Junior High Pastor. We interviewed a great candidate and it seemed like things were heading in the right direction. I was told we hired the guy and then quickly informed that we hired him as the Student Ministry Pastor and not the Junior High Pastor. I was a bit confused and learned that my beloved boss was being demoted and would eventually leave the church. Shortly after an opportunity came my way and I also transitioned away from the church. I've also seen some great transitions. When I was called to serve at SHCC in Henderson, NV I served with a dynamic team of leaders. About nine months into my tenure there my good friend Rob Hall asked me to step up and lead our entire Student Ministry. I was thrilled for the expanded role. Rob and I had a long handoff where we co-led the ministry for a few months, shared preaching, did summer camp together and casted vision to our leaders. I led that ministry for six more years and saw God do great things! These are just two examples from my life. I've talked with friends who have been on both sides of the coin in leadership transition. I've talked to guys who came to a church and the last guy did them no favors in the transitions. I've also talked with friends who had great handoffs with Godly leaders. I've consoled friends who have lost dear friends when leadership made quick moves and talked with other friends who were frustrated at how slowly their church responded to a needed change. A few months ago Willow Creek Community Church announced a leadership transition. Twitter was full of positive and negative comments. Friends in ministry talked about the announcement. Influential writers shared their opinion about the transition. Friends texted me to asked my thoughts about what Bill had announced. For a while I've held my thoughts to myself and the few people I've spoken with. I thought they weren't entirely important but continued to dwell on them. Have you experienced something like this before? I topic came up and you need some time to figure it out? You wanted to process, internally, what you were thinking? For how big of a platform that Willow Creek has, I think their decision for an internal transition was a great call. I highly respect Bill Hybles and his leadership. He talks about hiring people with Godly character, who are competent in their role, and find chemistry with those you work with. After talking about this for years he added something new. He talked about putting people in the right climate. By them choosing an internal transition they knew their team already loved the area! When serving in the Bay Area I worked at an amazing church. We had some internal transitions from young people who were interns coming onto full-time staff. By having an internal pipeline of leadership we knew what we were getting. This was a big take-a-way from my time in the Bay Area. I really enjoyed working with our team and seeing us promote people from within. As I think about church transitions, and now I want to talk primarily about the lead role, I think we are going to see more churches moving to a plurality of leaders. 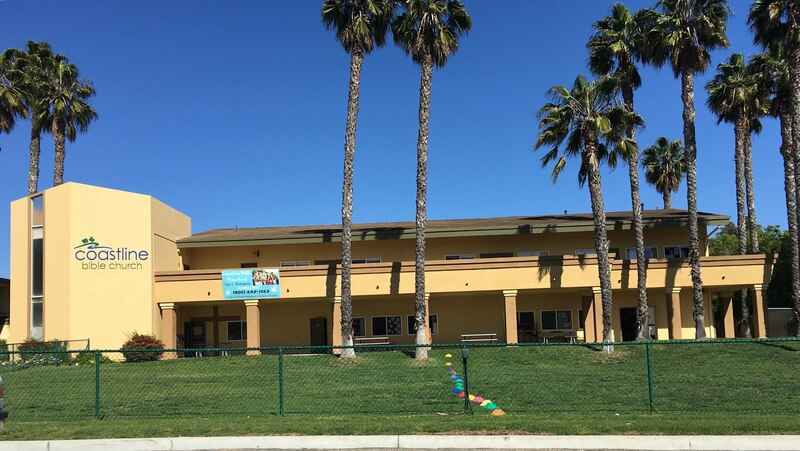 Think about North Coast church in Carlsbad. North Coast has led the way in a plurality of leadership. From what I know, they have four lead pastors. I don't know any of these men personally but have learned from two of them. From what I gather, two are the primary communicators but I'm not sure what the other two men do (I'm sure it's great work like executive pastoring). When I think about my generation there is a shift. We enjoy working in teams. This morning I was walking my daughters to school when my oldest said: "Dad we're doing a project on the Native Americans but I don't like it. At my last school we worked more in teams, here I have to do it on my own." She gets it! Working in a team is more fun, more collaboration and more ideas. I'm not opposed to leaders in their fifties leading churches, please don't hear that. I do think that we are going to see a shift and I pray it involves people of all stages of life. The church is longing for fresh vision and fresh leadership. When I think back to one of the most successful transitions I was a part of, I think the length of the handoff helped. Now I could see a handoff taking too long. If you are curious to know more about this, I encourage you to read Transition Plan by Bob Russell. I call this book a "plane ride read." You can read it quickly and talk with others about it. In the book, Bob talks about his transition with Dave Stone. I appreciate the time they worked together, the commitment they have to the local church and the openness in the handoff. When the leadership of a church are open about the plan it allows the people to think more about the plan. When their is more time to discuss, there is more time to prepare, process and pray. I like to think about raising up young leaders today to lead churches tomorrow. One of my life goals is to invest into young leaders and raise you strong followers of Christ. When you think about transition in a church, what would you add to the conversation. 2017 is officially in the books. This year held some great memories and also was a year of many tears shed. For this post I want to focus on the best seven things from this year. When I look back on 2017 it was a year of growth for me. It was a year of God stretching me, inviting me to grow and inviting me to fully trust Him. Early in 2017 I was reading Genesis. I read the story of where Jacob wrestled with God. When I think about the story I image that Jacob inflicted no pain to God in that wrestling match. I imagine him more like a child clinging to a father. This was a year of clinging to God and not letting go! These are in particular order but hold great memories for me! For our kids spring break we hoped on a plan and went to Maui! This is the third Hawaiian Island Ive visited and the second time we've taken our kids to Hawaii. The main reason for this trip was to celebrate my mom's 70th birthday. We had a great time with mom. We traveled all around the island, visited beaches, ate great food and took just enough pictures. One of my goals for 2017 was to take four family vacations. This was the main vacation we took. For this trip I shut off my email, rarely answered texts and I'm pretty sure I avoided social media. To make the trip even better was that I got to see my old friend Brian Theis. I'm so thankful for that week with my family! Near the middle of 2016 our Lead Pastor at CPC told me about a trip to Israel. I honestly never thought I'd be able to make that trip happen but in February 2017 I found myself sitting on a plane heading for the Middle East. Someone once said, "Going to Israel is like the fifth gospel." That person was right. I blogged almost every day of that trip. I took great notes, laughed a ton, hung out with people I love and my wife even joined on the trip! There have been so many times this year that I've thought fondly of those memories. There are times I've read the Bible and thought, "I've been there!" This year I want to encourage you to make Israel a priority to visit in the next three years. This was a big snowboarding year with my kids. I think that they each got over seven days on the mountain. We started our year with a five day trip to Heavenly Valley. This was another one of my family vacations where I avoided emailed and played with the kids. On our trip in January we received about six feet of snow. This meant more than snowboarding but also snow play! Some milestones of snowboarding with kids remind me of how important it is to spend time with them. There are so many hours we logged in the car having silly conversations. We listened to music on the drive, sung loud, ate treats, smiled on the hills and overcame our struggles. Sophie rode her first Black Diamond and Leah rode her first Blue Square. It was a huge year for my little girls! Moving to Ventura falls in the great category, but also can fall into the tough category. We love living in our new city but also miss our dear friends in the Bay Area. Ever since I can remember we've longed to move back to So Cal. Near the end of 2016 I felt this strong desire to get back to our home area. My mom had some health issues and then at the end of 2016 my dad became sick. Not only did we get to move back home, but we also got a great city! We live on a wonderful street, met some great people and love this city. After a few weeks of living here Charity said, "I feel like this is the first city we've lived where we both fit." When God called me to Vegas I always had this thought in the back of my mind that He would one day ask me to lead a church. When we moved to San Mateo in 2012 I knew this reality was coming closer but I didn't think I was ready. About a year ago I began talking with my pastor, Mark Mitchell, about this more. It was a great talk but super tough... Leading a church meant that one day God would call us to leave the Peninsula. Being just over six months into this new role I don't have it all figured out but am loving the calling. I enjoy the role God has given me and feel like I've functioning well in my gift mix. Coastline is such a loving church. Our leaders are so caring, the church is the most welcoming I've seen and the potential is endless. I feel so blessed to be a part of what God is doing here. This might seem like one that doesn't fit but it totally does. I love spending time with my family. I love riding rides and laughing with them. It's nice to live just a few hours from Disneyland and be able to take day trips to the park. With moving back to So Cal, we've seen our family more this year than we have in the last five years. 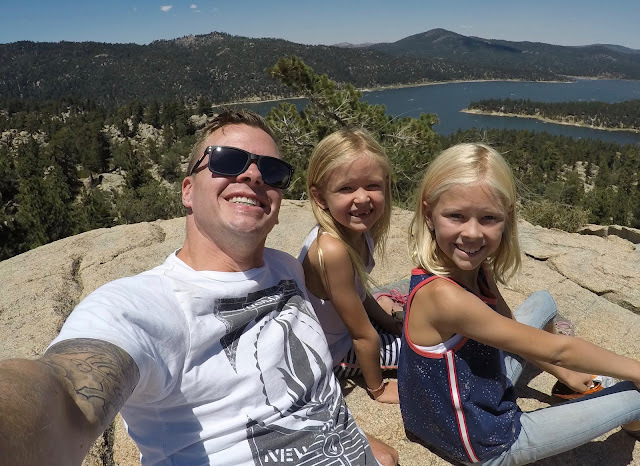 We've driven to Big Bear about 9-10 times. We've seen Mema and Papa in Santa Maria about the same amount of times. Part of our desire to move was to be closer to family. I'm thrilled that our kids are getting to see their grandparents more. It's a joy to see them interact with each other! When you look back on 2017 what are some of your favorite memories?